The work to be done by Drain Force Cleaning Ltd., hereunder, will be done with professional drain cleaning equipment and methods; methods do not include excavation. If it is found during the cleaning process that the drainage tile or any of the inside lines, or other lines being serviced under this agreement are settled, broken, deteriorated, damaged or are of such construction or condition as to make impracticable in the opinion of Drain Force Cleaning Ltd, to clean the line safely and properly with such equipment and methods, Drain Force Cleaning Ltd shall not be held responsible for such discovered conditions, and any repairs to said lines shall be done by and at the expense of the customer. After being notified, and necessary repairs are not completed within a reasonable time, the obligation of Drain Force Cleaning Ltd to complete the cleaning shall be deemed waived by the customer. The customer shall pay Drain Force Cleaning Ltd. a reasonable charge for services rendered. 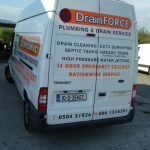 Drain Force Cleaning Ltd is not responsible for damage to the premises caused by the removal of the drain cover, which is removed in the process of servicing the lines. If it is found that drain cover is so rusted or fastened as to necessitate its replacement after removal, Drain Force Cleaning Ltd shall so notify the customer , and if the customer authorizes its replacement after removal, Drain Force Cleaning Ltd shall so notify the customer, and if the customer authorizes the replacement thereof, such replacement shall be made at an additional charge for the replacement of drain cover and the labour for it installation. Any work needed on clean out will need to be done by a licensed plumber. If the Ccustomer refuses to authorize such replacement, Drain Force Cleaning Ltd SHALL NOT BE RESPONSIBLE for damage thereafter resulting from sewer gas, back-ups or leakage through such cover, cap or opening due to rain and/or other causes. Drain Force Cleaning Ltd shall not be responsible for the cleaning of or damage of leaky of defective traps, hidden or unknown lead piping, improper or faulty plumbing, rusted or defective pipes, corrosion or unusual restrictions due to mineral or hard water buildup, harmful cleaning chemicals such as sulfuric or caustic acids, lines which are settled, broken, deteriorated or damaged. If during the cleaning process, fixtures are damaged or broken or defective or corroded drainage tiles or lines are broken or if Drain Force Cleaning Ltd’s equipment becomes lodged in any such defective lines, tiles, piping of plumbing and cannot be practically removed without excavation, Drain Force Cleaning Ltd shall not be liable for the removal of said equipment or for the repairs or replacement of such fixtures, tiles, piping of plumbing. This agreement covers only the items as listed on the reverse hereof, and the installed plumbing arrangements existing on the date hereof. Grass replacement, landscape damage, wall patching, painting, tile replacement, concrete replacement or any other type of damage done which is necessary to complete the fob is the responsibility of others unless specifically stated otherwise. Drain Force Cleaning Ltd is not responsible for undisclosed underground utilities and repairs under the slab are not guaranteed. The guarantee covers interim backup drainage failure of only the lines as serviced hereunder due to normal use, where a backup condition exists in the pipes serviced, and for the period of time as stated on reverse hereof. In the event of such drainage failure during the term of the guarantee, Drain Force Cleaning Ltd will, barring as inability to do so caused by an even beyond tis reasonable control (INCLUDING, BUT NOT LIMITED TO STRIKES, FIRE, FLOOD, CASUALTY, OR GOVERNMENT REGULATIONS, ORDERS OR RESTRICTIONS), furnish its services to remedy such failure as readily and as promptly as possible during normal working hours, but in no even shall Drain Force Cleaning Ltd be held liable for water or other damage to the property of the customer by reason of any delay. Any guarantee issued on any inside lines or main line shall cover any drainage failure due to normal usage, and shall not cover stoppages caused by intervening structural defects in the lines or stoppages caused by any rags, newspaper, or other objects not usually or customarily disposed of through the drainage system. If, during the guarantee period, Drain Force Cleaning Ltd finds that the stoppage was caused by such defects of abnormal usage, then Drain Force Cleaning Ltd. shall have the right to make an additional charge based upon the reasonable value of the service rendered in removing such stoppage. In the event customer fails to make payment according to the terms and conditions appearing on the reverse side hereof, Drain Force Cleaning Ltd MAY CHARGE INTEREST on the unpaid balance at the highest permissible legal rate of interest allowed by Irish law on the average unpaid balance. In the event, in the sole judgment of Drain Force Cleaning Ltd, it becomes necessary to institute legal action to collect said unpaid balance, Drain Force Cleaning Ltd shall be entitled to a judgment for the unpaid balance, accrued interest and reasonable solicitor's fees incurred in such legal action as allowed Irish law.